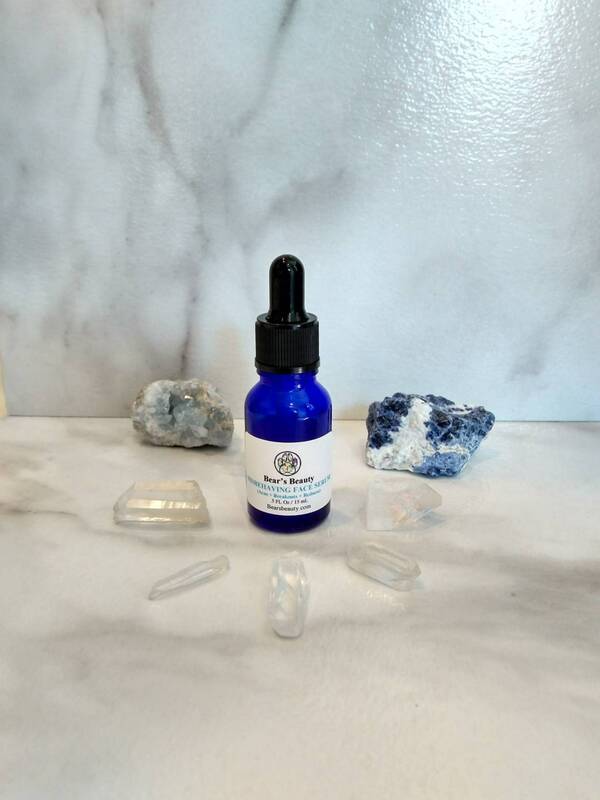 Misbehaving Face Serum : Acne + Oil Balancing + Anti-Inflammatory + Essential Oil Serum | Misbehaving Face Serum is one of my OG :) products, the very first serum I ever formulated, and continues to be a best seller. It is all things herbal and magical in one bottle, smelling of something you can't quite put your finger on with a blend of earthy Hemp Seed Oil and a trace of almost minty Sweet Birch. If a gypsy traveled the world to gather ingredients to make you a serum, this would be what she came up with ;) trust me! Carefully blended to be gentle, but effective, this serum can be used twice daily on your face + chest + body! Organic Hemp Seed Oil helps gently nourish + unclog pores + reduce redness + calm irritation + and so much more. The proprietary essential oil blend addresses acne holistically, to address multiple types of acne and other skin concerns. I also offer a version with no essential oils, as well as a new HIGH FIVE | MISBEHAVING SKIN FACIAL OIL. Not just for acne. anyone with skin that just misbehaves. If you have more sensitive skin, go for the NAKED version of this serum, it has a lower essential oil dilution rate as well as a base of just Raspberry Seed Oil. Pairs well with the NIGHT ACNE + SCAR SERUM! Bear's Beauty products are not made for specific skin types, but for specific skin issues and concerns. I formulate every product with truly sensitive + acne-prone skin in mind. No comedogenic oils (like Virgin Coconut or Sweet Almond) and no Coconut-based Emulsifying Waxes. ☯Any kind of breakouts: hormonal, cystic, teenage, or otherwise, TRY THIS! This plays well with others, while I do think it is best to use only natural products, you can add this serum to any routine you are already using. ★Unlike most Acne Serums on the market, this oil-based serum will not dry your skin out or leave you flaky. I have quite a few products for Acne + Breakouts + Post Acne, especially geared toward Sensitive Skin. This serum was the start of it all. This was one of my very first products, over the years it has been refined, but it is still my favorite. Misbehaving Face Serum is ideal for a host of skin concerns, if you have any concern as well as acne, this is the serum for you. 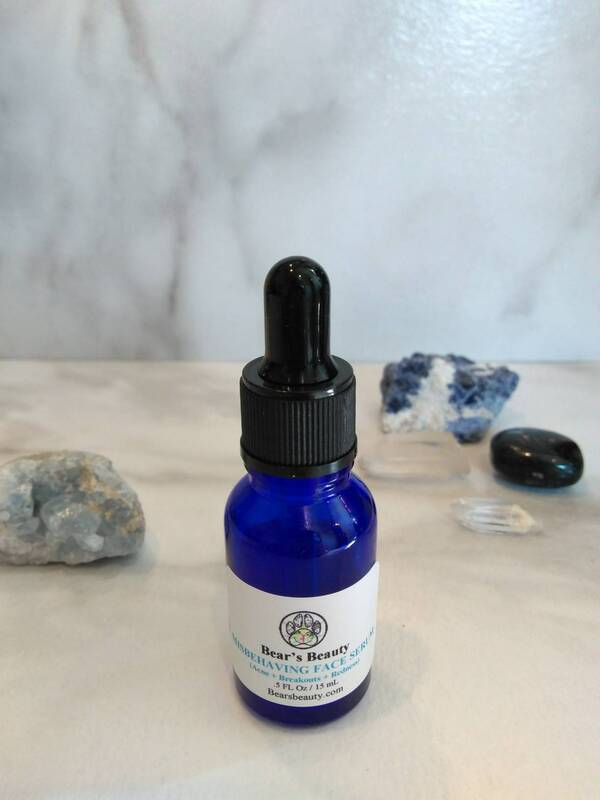 If you happen to have sensitivities to Hemp + Sunflower or one of the other carrier oils, then you want the Naked Misbehaving Face Serum, made with a base of just Red Raspberry Seed Oil. For Post-Acne use this serum Am and the Night + Acne + Scar Serum at night. ◆ Essential Oil Blend of more than 12 Therapeutic and Organic Essential Oils works to reduce symptoms of breakouts as well as encourage healthier skin. Blended at a safe therapeutic ratio. ◆Made to nourish skin + reduce breakouts + soothe + calm + balance oil + reduce redness + so much more! ★Organic Hemp Seed oil is amazing for Acne. It is also great for oily skin + blackheads + redness + and signs of aging. Packed with Omega Fatty Acids that encourage healthy cell regeneration. Anti-Inflammatory + light + never greasy. ★Red Raspberry Seed Oil offers natural SPF protection as well as high antioxidant content. ★Sea Buckthorn Oil is rich in Vitamin A, B, C, and K as well as omega fatty acids, offering nourishment as well as necessary building blocks for new tissue. This addition helps with scarring specifically. ★Organic Sunflower Oil Infused with Calendula Petals further soothes irritated skin. ★Last, but not least, we have my essential oil blend. Each oil has specific properties. This blend is proprietary, but feel free to message me about allergies. The blend is made using only Organic and Therapeutic Grade Essential Oils, and contains more than 12 essential oils. I am not selling magical solutions, all of these remedies take time to work. They all act by supporting the natural processes of your body. There is no set timeline for results. There are so many factors that play a role in the efficacy of a product, down to how much water your drink and how stressed you are. That being said, I can offer some information I have gathered from my own and other customer's experiences. Depending on the severity of your acne, this one product may address the issue. I had results within a week, and many customers report softer + smoother skin right away. Over time, breakouts + redness + irritation is reduced. *^Hemp Seed Oil, *Sunflower Seed Oil, ^Red Raspberry Seed Oil, *^Argan Oil, *Sunflower Oil infused with *Calendula Petals, *Sea Buckthorn Oil, *Rosemary Extract and Proprietary Essential Oil Blend. This does NOT contain CBD or THC. Etsy does not allow CBD sales at this time. Cleanse skin with mild cleanser, like Cleansing Oil. Mist skin with Hydrosol or Aloe Vera, applying oils over a water-based hydrator helps the serum absorb deep into the skin and seal in moisture. Apply 4-5 drops to hands, pray them together to evenly distribute between palms, gently press into damp skin. OR Drop one drop on your forehead + cheeks + nose + chin. This can be your last step, or you can apply a facial oil or balm after 3-5 minutes, once the serum is absorbed. ❤"Wonderful product! A little goes a long way and it smells amazing too. I'm 46 and have rosacea. I've been been searching for an all natural "calming" product. After about a minute of applying this healing serum to my face for the first time, the redness diminished to at least half. I've been using this product for almost 2 weeks now and the redness continues to diminish. My daughter commented how awesome my skin is looking. : ) I really like what I see in the overall feel and appearance of my skin. Look forward to trying your other products! Thank you forever!" "This stuff works so well!"